Social media is feeding FOMO – Fear Of Missing Out – which, ironically, is making many of us miss out on something much more valuable: JOMO. The Joy Of Missing Out is about simplicity and the joy of not being overwhelmed. Stoked by social media, our all-too-common fear of missing out, or FOMO, is often cited as a reason why we live beyond our means, take on debt and generally feel unsatisfied at home and in our careers. It’s why we put so much pressure on ourselves to have Instagram-worthy lives, 24 hours a day. 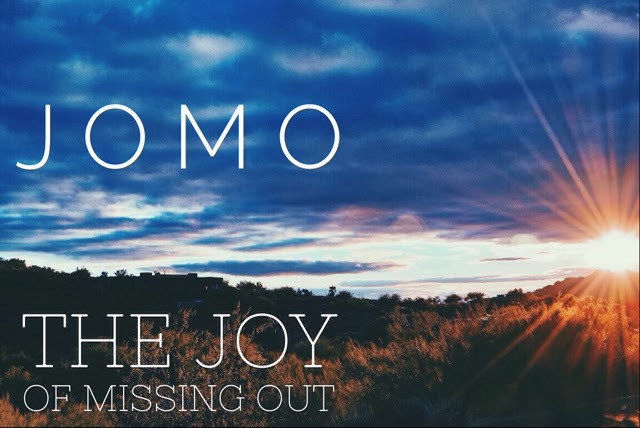 JOMO provides the elation of stepping away from our screens. Take a social media detox and feel the happiness that comes from disconnecting. Social media life is not Real Life: You see a Facebook post of someone having a great time and think “What’s wrong with me? Everybody is out having a great time. Why am I not on vacation or visiting friends or going to the newest restaurants?” What you are seeing are snapshots of a person’s life. Those snapshots don’t tell the whole story of a person’s life. And chances are their life is just like yours. Busy is not everything: There is an expectation that success means that we are always surrounded by people and always on the go. And that busyness is a badge of honor, so we fear being alone. We fear missing out. We need to set boundaries, carve out a little time to do nothing. Our time to be quiet and alone increases our cognitive power. Replying is not a sport: Let go of the pressure to reply to everything right away. Replying quickly is not an Olympic sport. You are not going to get a medal. Put the phone aside. Connectivity is not connectedness: Nonstop connectivity makes us feel compelled “to do.” We gotta do. We gotta go. And we are so focused on the doing and the going that we forget to be. Connectivity is our capacity to link and have access. Connectedness is our ability to have substance. Missing out is not what’s really scary: It’s the fear, in the fear of missing out, that should scare us the most, because we are missing out on what matters most when we are merely reacting to the events around us. That is why you can miss out, and feel joy. An earlier version of this blog appeared in the Robert H. Smith School of Business “Brain Trust” on September 13, 2018.